Martinibuster started a great thread titled Anatomy of an EPC Collapse. One of the points mentioned in it was too much inventory. AdSense ads have been appearing on many MySpace pages, even on pages when there is not much content to target against. Google also recently signed up Friendster as an AdSense publishing partner. These social networks are hard to monetize. Valleywag recently highlighted Facebook as one of the worst sites to advertise on. If you bid on anything remotely related to the various large social networks with a dime a click max CPC you are going to get a lot of exposure. Here are some of my logs from my affiliate software. Out of a 20 minute period I likely got at least 9 clicks from MySpace. If being one of the default backfill advertisers costs you only $12 a day that is going to cost you about $4,000 a year in worthless advertising costs. If you are an advertiser and bid on keywords that trigger ads on these sites, and that leads to many impressions and ad clicks without any conversions it is best to filter those sites at the campaign level using site exclusion. Use facebook.com and mspace.com to ensure you filter out all subdomains. If you are a publisher, and people filter out these low value networks by name (ie: facebook, myspace, etc.) rather than URL, then you are filtering out a lot of advertisers if you mention those sites sitewide. 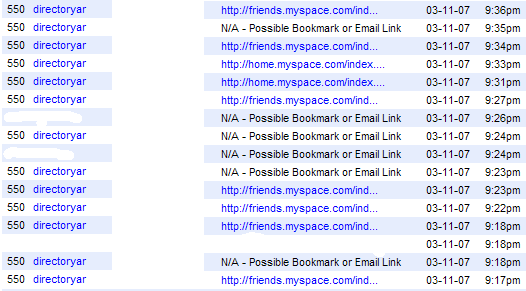 You need to make sure you do not place sitewide links to profile pages on these sites using their official names in the anchor text if you do not want -myspace to filter out your ads. Other terms that kill your ad targeting are worth avoiding. If a word has a glut of low value advertisers and is associated with low value content may also make sense to filter it out, like blog. Think of words associated with large untargeted traffic streams as being the new poison words, especially if you use contextual advertising. I believe you meant myspace.com, not mspace.com. As an advertiser i almost always filter out international content ads as they usually have horrible conversion.